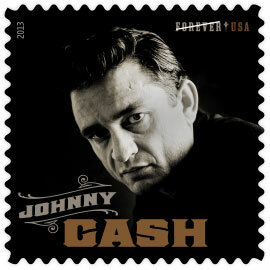 Johnny Cash fans can now affix their favorite singer to letters sent via the United States Postal Service. WASHINGTON – Johnny Cash fans can now affix their favorite singer to letters sent via the United States Postal Service. A stamp will be issued this year as part of the Music Icons stamp series, reports Beyond the Perf, an online extension of the USA Philatelic catalog. The stamp resembles the appearance of a 45 rpm record sleeve and features a photo of the “man in black” taken by Frank Bez during a photo session for “Ring of Fire: The Best of Johnny Cash” in 1963. The Johnny Cash stamp will be issued as a “forever” stamp. The release date has not been set. Tejano musician, Lydia Mendoza, inaugurated the Music Icon series with a stamp featuring her strumming her 12-string guitar.